My common sense may have deserted me when I was onboard Cebu Pacific flight 5J527 and 5J528, but my friend’s dad didn’t and he bought Cebu Pacific’s mini flexi-tripod. I managed to succesfully pester Anna to meet up so we can compare the two tripods. All I can say is that I am glad that I bought the original Joby Gorillapod. After seeing, feeling and trying the cheap imitation, I was relieved that I invested on my tripod. That’s where the similarity ends, though. 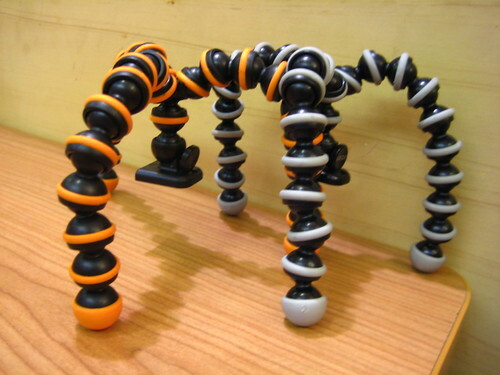 When handling the Gorillapod, one of the first things you’ll notice is that it’s pretty hard to position the legs. Not because it’s not flexible, but because it’s (for lack of better word), tight. In contrast, the flexi-tripod is very very loose. 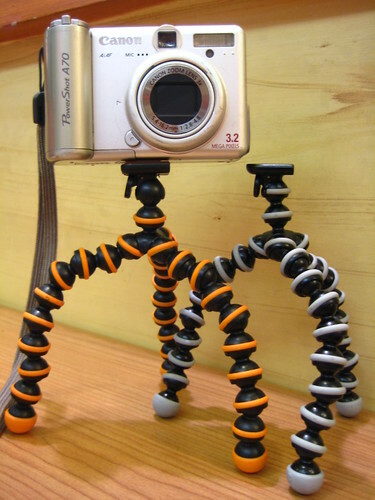 Think of it this way: the flexi tripod moves like a graceful dancer, while the Gorillapod is dacing the robot. This, however, plays a factor on how stable the tripods are. 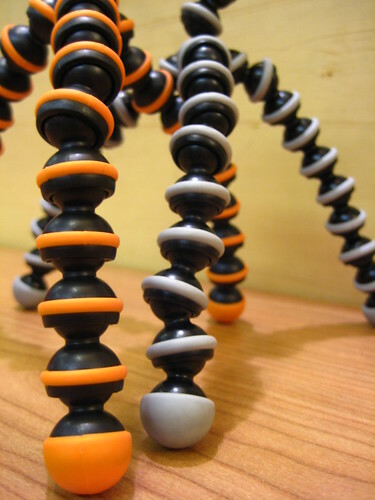 The Gorillapod with its strong joints, as well as its grips makes it a really stable tripod. The rubber grips of the flexi-tripod, on the other hand, is very smooth, which makes it prone to slipping. Don’t get me wrong, you *can* still use the tripod; it’s not totally useless. I was able to put my rather heavy Canon Powershot A70 on it and it managed to stay upright. I doubt that I would use it if I’m to attach the tripod to a chair back or a winebottle. In the end, I am not regretting my decision to shell out Php1,400 for my Joby Gorillapod. Afterall, I am getting quality for that price. The flexi-tripod can be used as a regular tripod, but you don’t buy a Gorillapod-like tripod just to use it in the conventional way, right? Anything you can do, I can do as well. Though not necessarily better. You don’t have to get onboard a Cebu Pacific flight to buy this flexi-tripod. I was at Quiapo last Saturday and saw similar tripods being sold at the photography shops around Hidalgo. The point and shoot version sells for Php 450, while the SLR version costs Php 1,800 at Henry’s Cam (fronting SM Carriedo). Remember, you get what you pay for. This is a well-photographed review. I appreciate that you clearly showed side-by-side performance in identical positions. Cute ng photos. I would like to try the tripod for the DSLR..still don’t have one yet. pusa: Good luck! I’m looking forward to reading your review! dyanie: Nyahaha, so, bibili ka na ba? Great review Nins! Admittedly, the el cheapo version is still attractive to me, since it is, el cheapo, pero kung nasa 450 or so na, I’d rather not spend. Do you think it performs the same way as my teeny tiny el cheapo tripod? (I’m crossing my fingers you still remember it.) Or is it flexible enough to add functionality not attained my by tripod? Oh yeah, the Joby one, they have different versions for point and shoot and DSLRs? kaoko: I actually didn’t attempt to attach the camera to the flexi tripod while it’s attached to something. The A70 was pretty heavy and the flexi tripod was already straining under its weight even if it was just upright. But you’re using an Ixus right? You *might* be able to attach it to things, but maybe not attempt any daring positions? 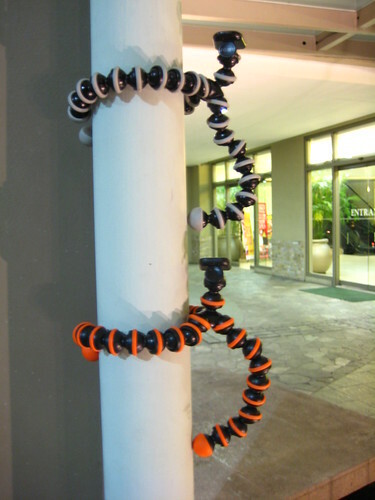 The Gorillapod has a bigger version for DLSRs and DSLR with zoom lenses. They’re so much bigger than the Gorillapod for P&S, but not so much bigger that you can’t put it inside a bag. Guess what — I didn’t use it at all during the holidays! Anna: I dunno why Cebu Pac is selling it for so cheap on their flights. The ones they’re selling at the camera shops wouldn’t THAT much better, right? hmmm..
Good review, but why don’t you test out the generic one on a real photoshoot? Bring it somewhere and tell us how it failed or how you found ways around its shortcomings. Because we’re left pondering whether the generic one is a cheap alternative or simply a waste of money. Hi Chris! Well, first off, the tripod wasn’t mine, so I had to work with my friend’s schedule ^_^; And after seeing how slippery the grips are and how soft it felt, I don’t feel all that confident proping my camera on it, be it the A70 or the Ixus. Oh, and I was told that the A70 (and similar cameras) are too heavy for the Gorillapod, so it would probably be too heavy for the flexi tripod as well. Just got the generic Gorillapod a couple of days ago. This is my “quick-fix” article to make it perform. So i may be 4 months late with the comment… stumbled upon your blog while doing research on the joby gorillapod. i have 3 friends who swear by it so ive been thinking of getting one. however, i do see el cheapo ones everywhere… dont think the ones i saw at digital print/ island photo were the orig ones. they also sell at 450 and up. i dint go for that, instead i saw this 88 peso mini f’orillapod (fake gorillapod — thats just my pet name for it) at an 88peso japanese grocery store in waltermart. its about the height of an ipod touch, and made of metal, so its quite sturdy. just not as flexible as what the joby one might be. i couldnt wrap it around my dresser handle and make it stay there. however it looks nice on my desk and well, it IS sturdy enough to be a tripod. i may still buy the orig joby … maybe i’ll buy it in the states bec $25 doesnt seem as steep as buying it at 1,500 pesos here. where can I buy these cool cebu pacific’s tripod?any contact number? need it asap. I will order 120 pcs. Nyek buti na lang I read this. I was planning to buy pa naman on my next CebuPac flight! Wait they sell the gorilla pods sa Plane? so that means pwede hindi e check in yung kung mag dadala ako nang gorilla tripod? This is a very old article, and I’m not sure if they still their flexi tripod onboard. I was able to bring my Gorillapod in my hand carried bag, but again, policies vary per airline/airport.